Clean and continuous friction climbing to the summit of an isolated sandstone peak. 9 pitches of multi pitch rock climbing. 5.7 | Grade III/IV. Comparable to the low angle crack climbing on checkerboard Mesa or the popular Aries Butte. Descent involves a 120ft rappel and 3rd class downclimbing. Our trips are efficient and streamlined to maximize your time in the field. We use modern safety systems and simple instruction. See photos of this rock climbing route. This trip is available year round with the exception of 100+ degrees days or when the cracks are filled with snow. 4-8 hour duration. 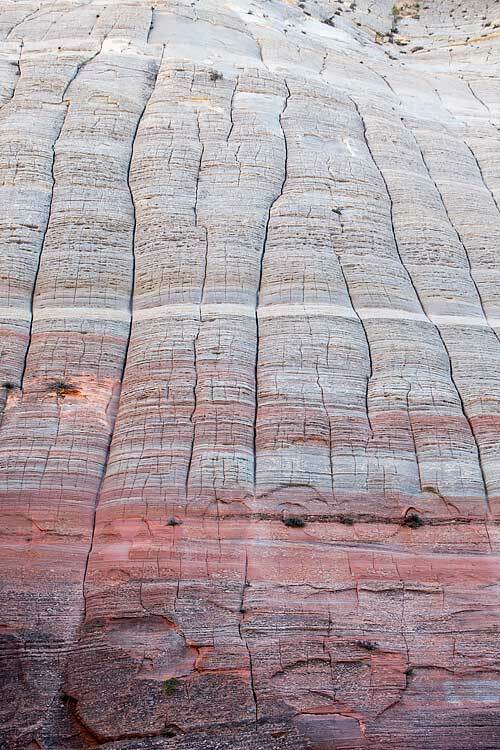 This trip climbs a specific white rock sandstone formation east of Zion National Park. This trip has a max ratio of 4 guests to 1 guide. We pick up for all trips. Our services are available from most Zion National Park lodging options. We have regional meeting locations for guests staying outside of our pickup range. Start time is finalized at time of reservation. 7AM -10AM depending on season. Eastside Camping or Lodging options. Dress for the season but do not wear your favorite clothing items. Knee length shorts and T-shirts are commonly used during the summer months unless extra protection is desired. Short-shorts, tank tops, and jeans are not recommended. All of our trips are private. 6.35% sales tax is added to all services. Contact us to place a reservation. We offer a comprehensive selection of areas and climbing route styles. It is important to understand that guided rock climbing trips take place in routes located on public lands surrounding of the park. 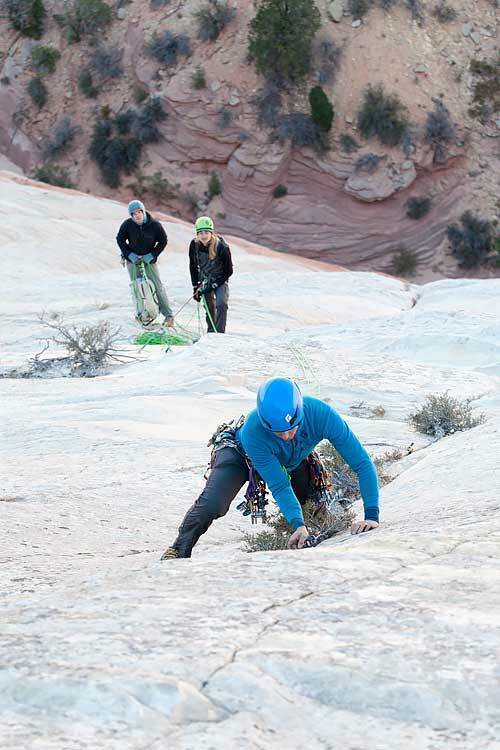 Zion National Park prohibits commercial rock climbing within its boundaries and all technical climbing within the park must be done as a private party. It is not possible to hire a guide for climbs such as Moonlight Buttress, Touchstone Wall, or Prodigal Sun.